Well guys and gals, after today there are only 2 more Smashing Saturdays articles left! One the week before the official release, and one the Saturday afterwards. I’m getting really anxious to play Super Smash Bros. Ultimate, but in the meantime let’s go over some weekly updates. This week is a bit more focused on characters, Assist Trophies, music and stages, which I appreciate. Not that there’s anything wrong with info about Spirits, but it mostly felt like rehash. So let’s see what’s new this week. One of the things I love most about the Smash Bros. series is how it opens a wide umbrella, bringing in characters and items from a wide range of game series. Initially I wasn’t sure about Ryu’s inclusion, but since he opens the door to Ken and Assist Trophy Guile, I think I’ll be okay. Fun fact, I grew up only playing as Guile in Street Fighter, since the button combinations for Hadoken and such were too much for my young self. I quickly grew much better at using all sorts of moves, and have the callused thumbs to prove it. 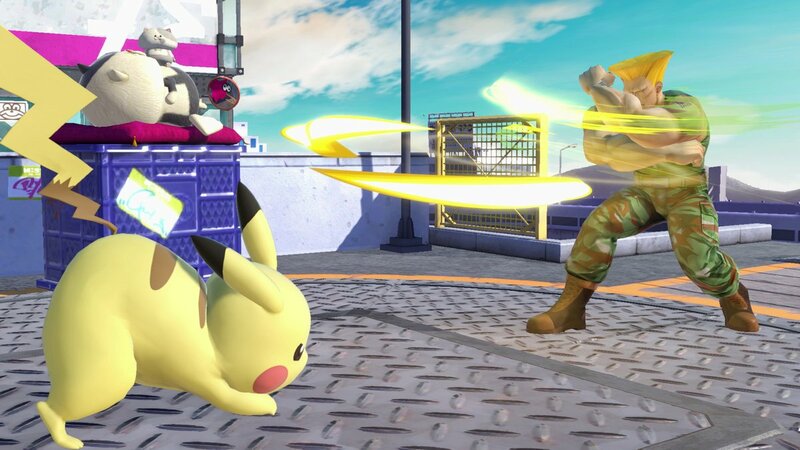 Guile will fight in Smash Bros. much like in Street Fighter, crouching patiently only to deliver a furious Flash Kick! Also, according to this image, he’ll also throw out his iconic Sonic Booms once in a while. There’s a lot of music in Ultimate, but I welcome all the new songs. Especially when they are as epic and hard rocking as King Bowser, from Super Mario Bros. 3. It’s composed by Koji Kondo, and I can’t express enough how great it is. To take a listen, just click here. 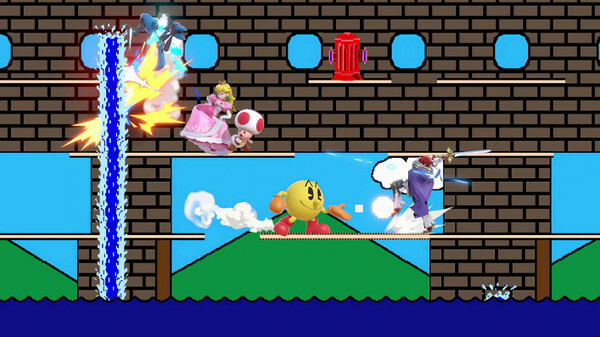 I’m just gonna go ahead and say I don’t like the scrolling stages in Smash Bros. There’s too many variables that can screw things up, and they tend to penalize the slower characters. I liked the idea of scrolling stages at first, but after playing for hundreds of hours in the last game, I think I’m ready to play them solely in Omega Form. That said, Pac-Land is back, and it’s just as incredibly weird as usual. You never know what’s gonna kill you in this throwback level. Speaking of throwbacks, there’s few I love as much as this next one. Chef Kawasaki is now an Assist Trophy! 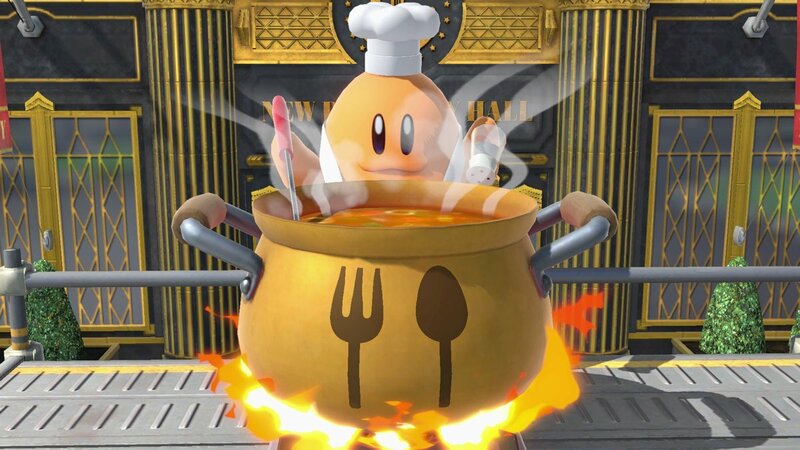 This iconic frenemy from the Kirby series does what he’s best at, gathering everybody for the ultimate hot pot. You’ll take burn damage while in his pot, and when he’s done with you he’ll cook up healing items for whoever summons him. Iron Chef has got nothing on Kawasaki. Next up, stick around for the latest Most Wanted Brawler! I know what you’re all thinking – this isn’t the Grass type you want in Smash Bros. But bear with me, there’s a reason I felt Serperior should make the cut instead of Decidueye. Sure, Decidueye has a bow and arrow and Serperior has a tail. But the pattern thus far for recent Pokémon inclusions has been they’re starters from different generations. Greninja hailed from X / Y, while the newly announced Incineroar is from Sun / Moon. So since we have a Water and Fire type from two different gens, why not a Grass type from yet another gen? Which led me to the serpentine Serperior. 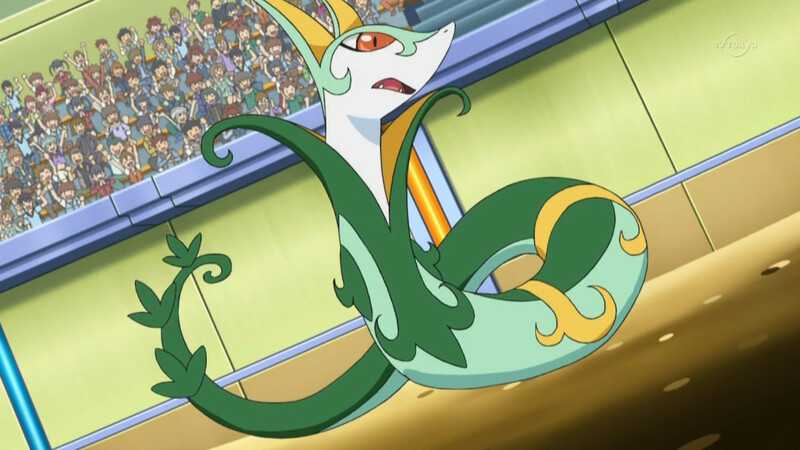 While Serperior may lack arms and legs, he could make up for it with slithering speed and superior reach. I could see that tail serving as a multipurpose weapon, and perhaps he could even use it to ledge grab. As for Serperior’s attacks, I can see some interesting possibilities. His Neutral B would of course be a Leaf Blade, bringing his tail down in a slashing motion against foes. By pressing it repeatedly upon hitting a foe, it would create a whirlwind of slashing mayhem. His Side B would give him some long distance with Leech Seed. Though easily stopped by guarding or dodging, when successful it would drain HP from the victim back to Serperior for a few seconds. His Up B would be a Leaf Tornado. Using his tail, Serperior would whip upwards in a leafy gale, but by holding the attack instead, it would hit land borne foes in a wide arc instead. Finally with Down B, he would grab any nearby foes with Wrap, preventing them from moving while putting some hurt on them. Best of all, he would be able to transition from Wrap into a throw with a simple directional input. Lastly, for his Final Smash he would use Z-Move Bloom Doom, draining energy from surrounding plant life and using it to devastating effect. Sure, Serperior is strange, and perhaps not the most obvious choice for a Grass starter. But there’s no reason he couldn’t be a potential brawler. To see the next crazy Most Wanted Brawler, be sure to join us at oprainfall next week for Smashing Saturdays!